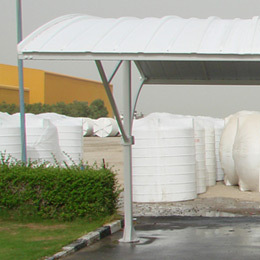 Polycon’s new range of polyethylene car sheds is ideal for the harsh weather in the region. These state-of-art sheds are absolutely maintenance-free and depending on your choice of design, you can choose from white or any other colour. 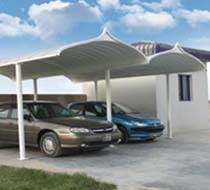 Polycon car sheds are available in various shapes/design Curve Design, Islamic Designs and Cantilever Design. Polycon’s new range of polyethylene tank sheds is ideal for the harsh weather in the region. These state-of-art sheds are absolutely maintenance-free and depending on your choice of design, you can choose from white or any other colour.